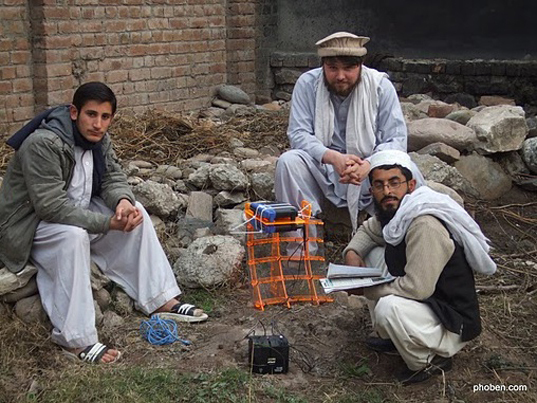 Here’s an incredible story about upcycling and human ingenuity to brighten your weekend: the MIT Fab Lab is teaching people in Pakistan, Afghanistan and Kenya how to make their own DIY wireless internet networks out of easily found local materials. Just $60 of readily accessible materials like cans, wire, and plastic tubs can stretch an ad-hoc network made of two over-the-counter routers and make it work for thousands of people. A simple car battery can power the system, so there’s no electrical infrastructure required – which is a boon to villages in places like Pakistan and Afghanistan where an electrical grid is unreliable or nonexistent. Check out the story on SFGate if you want to find out how to build your own network – it can be done virtually anywhere! Here's an incredible story about upcycling and human ingenuity to brighten your weekend: the MIT Fab Lab is teaching people in Pakistan, Afghanistan and Kenya how to make their own DIY wireless internet networks out of easily found local materials. Just $60 of readily accessible materials like cans, wire, and plastic tubs can stretch an ad-hoc network made of two over-the-counter routers and make it work for thousands of people. A simple car battery can power the system, so there's no electrical infrastructure required - which is a boon to villages in places like Pakistan and Afghanistan where an electrical grid is unreliable or nonexistent. Check out the story on SFGate if you want to find out how to build your own network - it can be done virtually anywhere!